Senior defensive end Daelin Hayes has been a key contributor to Notre Dame’s talented defensive line for the past two years. Now, he looks to take the next step towards making his mark on the Notre Dame defense. Hayes believes attention to detail and focusing on making smaller plays can help him elevate his game to an elite level. After an explosive sophomore season where he recorded 6.5 tackles for loss, Hayes’ stats stagnated in his junior year, which resulted in slightly less playing time. When asked what he needed to focus on to get back into a rhythm, Hayes emphasized a more fundamental approach to his playing style. “Settling down and freeing myself of the burden of trying to be the big play guy and just playing football and letting the game come to me is something I’ve been focusing on,” stated Hayes. As an experienced senior in Clark Lea’s defense, Hayes has the responsibility to lead the younger players on the team. He seems very excited about his new leadership role and expressed excitement about the talented but developing players. Daelin Hayes recognized how important it is to have strong leadership on the team, and what he needs to do to step into that role. That leadership role starts with accountability, and Hayes understands the impact he can have on the team. 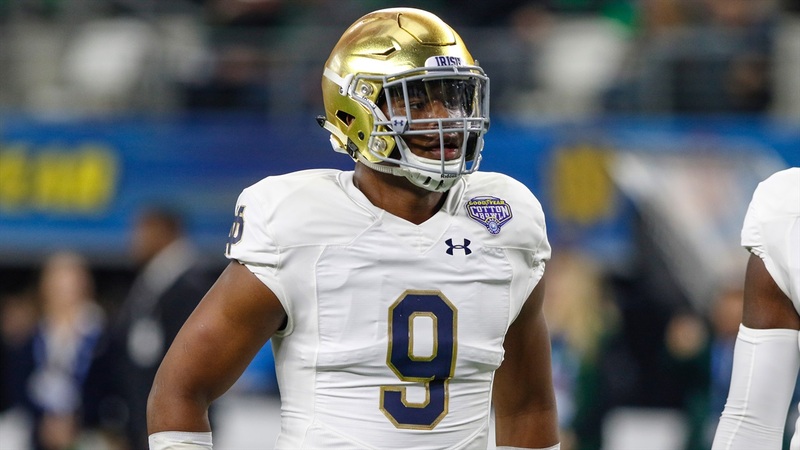 As an early enrollee in 2016, Hayes has played under multiple defensive coordinators in his time at Notre Dame, most notably switching from Brian Vangorder’s 4-3 base defense to the 4-2-5 preferred by Mike Elko and his successor Clark Lea. He expressed the importance of having continuity at the coaching position and how Brian Kelly’s consistent coaching staff is helping the team grow. That added confidence is shown in a defensive line that believes it can be the starting point of attack for a talented Irish defense.